“Which Style Do You Like?”, image 7″ x 8.5″, paper 16″ x 20″, three-plate laser-cut woodcut print on masa paper. Edition of 18. Created for the Print Exchange Portfolio project at the Campana Center for Ideation and Invention at LCCC. “Feminine Intuition III” and “Feminine Intuition IV”, 11″ x 8.5″, acrylic multimedia collage on Morgan handmade paper. “Feminine Intuition I” and “Feminine Intuition II”, 12″x 18″, acrylic multimedia collage on BFK. “Climate Change U.S.A.” 17″ x 6″, 2-plate linoleum print on BFK. “Tree | Paper” 10.25” x 8.5” closed. Woodcut, lino print, toner transfer collage on altered book. 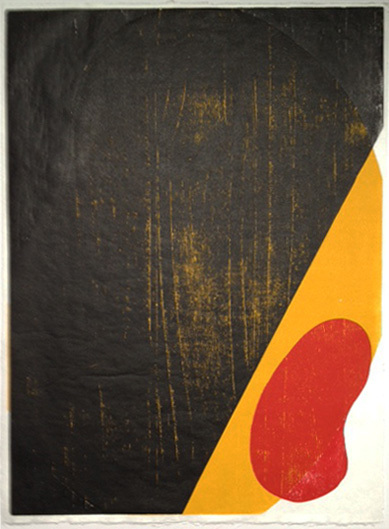 “Impermanence”, 23″ x 34″, collaged reduction woodcut print on Morgan mulberry and BFK. “In a Box”, 65″ x 40″ large scale woodcut print on masa. Printed with Lyell Castonguay of Big Ink Prints at Artist Image Resource in Pittsburgh. Traditional white line woodcut technique used to create portraits of contemporary digital representations of people who are alike and different at the same time. “Avatar Portrait Ava”, “Avatar Portrait Bea”, “Avatar Portrait Celia”, “Avatar Portrait Dee”, 20″ x 20″ framed, printed on BFK. These prints were included in the Artists Archives of the Western Reserve’s juried “New Now” show September-October 2016. They were also exhibited in The Nicholson B. White Gallery at St. Paul’s Church; “The Salon Shows”, Work of four artists from Cleveland, March-June 2017. Smaller than “Avatar Portraits”, these six white line color woodcuts are 8″ x 8″ on BFK and are meant to be viewed as a group: “Gender Brown”, “Gender Pink”, “Gender Periwinkle”, “Gender Black”, “Gender Gray”, and “Gender Chartreuse”. These six color white line woodcuts are 10″x 10″ on BFK and are meant to be viewed as group: “Arabic Avatar”, “Chinese Avatar”, “English Avatar”, “Russian Avatar”, “Somali Avatar”, “Mexican Avatar”. 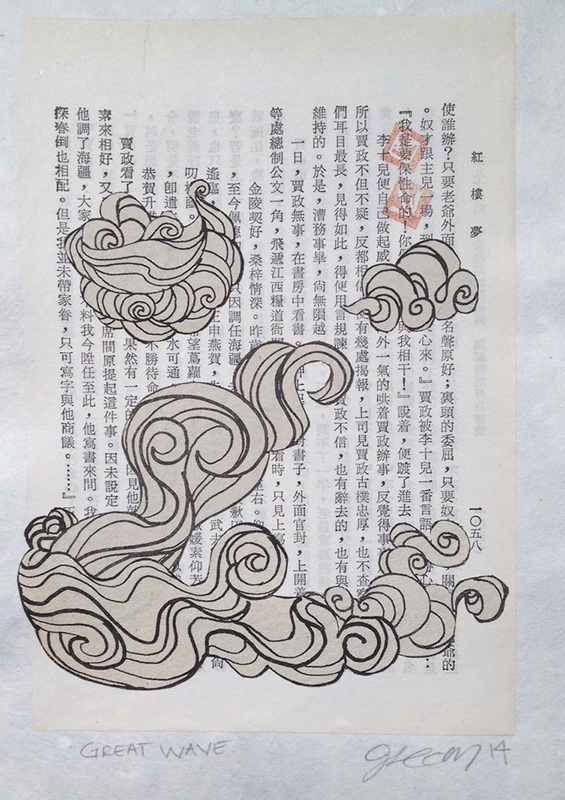 The text in these prints is from Chapter 8 of Italo Calvino’s book, “Invisible Cities”. The chapter is called “Continuous Cities 2” and describes the city of Trude which “does not begin and does not end. Only the name of the airport changes”. These six color white line woodcuts are 11″x 11″ on BFK and are meant to be viewed as group: “Identity Crisis 1”, “Identity Crisis 2,” Identity Crisis 3″, Identity Crisis 4″, Identity Crisis 5 “, “Identity Crisis 6”. These prints were exhibited in The Nicholson B. White Gallery at St. Paul’s Church; “The Salon Shows”, Work of four artists from Cleveland, March-June 2017. “Super Real”, 12″x19″, Color woodcut and linoleum print with acrylic wash on BFK. “Super Real Triptych”, Three 12″x19″ prints, color woodcut and linoleum with chine collé, toner transfer, acrylic wash and bullet holes on BFK. This print won “Best of Show” in the 2018 Valley Art Center Annual Juried Exhibition in Chagrin Falls. “Person”, 13″ x 20”, Woodcut reduction prints on BFK paper. A series of 6 possible versions of a person as suggested by the Apple iPhone emojis. All prints in the series were created from one block. “Thinking of Guns”, two 8″ x 6″ linoleum prints with chine collé on handmade paper and mulberry. Showing at Manhattan Graphics Center in NYC in the juried exhibition “The Print Effect 2018: Small Works/Big Impact” November 1–30, 2018. “This IS a Yellow Daffodil”, 13″ x 17″ each, Woodcut reduction prints on BFK paper, 3 variations. This print was chosen by poet Damien McClendon to respond to in Heights Arts’ Ekphrastacy event in May. 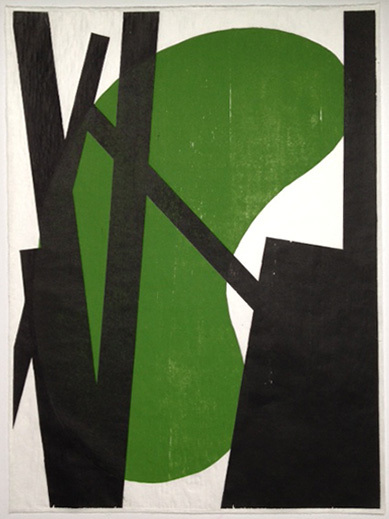 “Construct/Destruct/Construct Midtown CLE I-III” , 22.5″ x 13”, Woodcut reduction print on BFK paper. A series of 3 versions of a map of midtown Cleveland. The process of reduction printing (building the map image then destroying what you have built to create the next layer) mirrors the building and rebuilding that has occurred in Midtown during the history of Cleveland. Series of prints, “Mixed Emotions”. 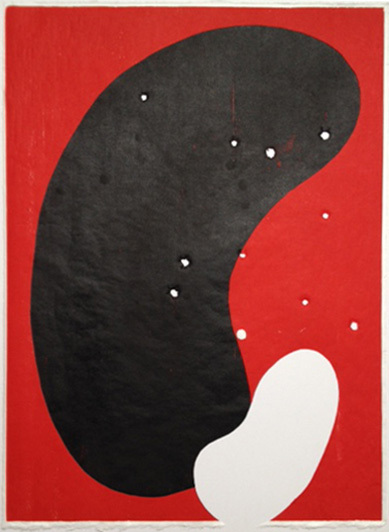 Prints are 16″ x 22″, woodcut with bullet holes. “Mixed Emotions” is a series of 8 multicolor woodcut prints made by mixing 5 wooden plates. “Fading Memory I-IV″, 5″ x 4.5″, Digital photograph toner transfer print and woodcut. 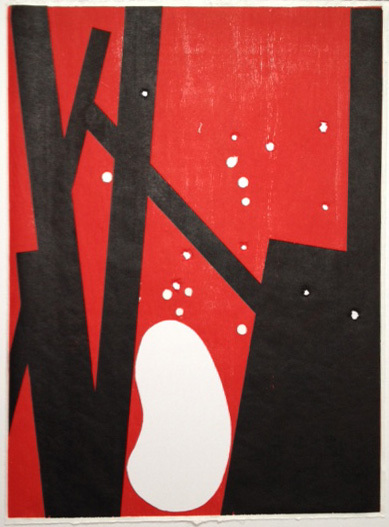 “Silver Lake II″, 24″ x 11″, Woodcut and linoleum print on BFK paper. Variation on Silver Lake I. “Truth 2016″, 16″ x 12”, Woodcut reduction print on mulberry paper. “Cold Comfort 1”, 13.5″ x 10.5″, Linoleum reduction print and toner transfer on BFK paper. “Media 2016”, 25″ x 6.5″, Woodcut print on BFK paper. This print was accepted into the Morgan Conservatory Fifth Annual Juried Exhibition “American Fiber”, March-April 2017. “#Candylandscape53″, 16″x 16” two-plate color reduction woodcut print on BFK. This print was accepted into the Waterloo Arts Juried Exhibition 2017, June-July 2017. “Unity”, 5″x 7″ on mulberry. Color reduction woodblock. Print started in moku hanga style, (water based inks) and finished with oil based inks. “Daffodils”, 12″ x 9″ acrylic painting on canvas board. Yearly spring daffodil project, 2014. “Narcissus”, 15″ x 16″ linoleum and monotype on mulberry paper. “Narcissus II”, 8″ x 11″ two-pass monotype on hand made paper. “Exoplanets”, 8″ x 11″ two-pass monotype on hand made paper. This print was made as a ghost print from the second (green) pass of the print above and using the ink from under the circular stencils. 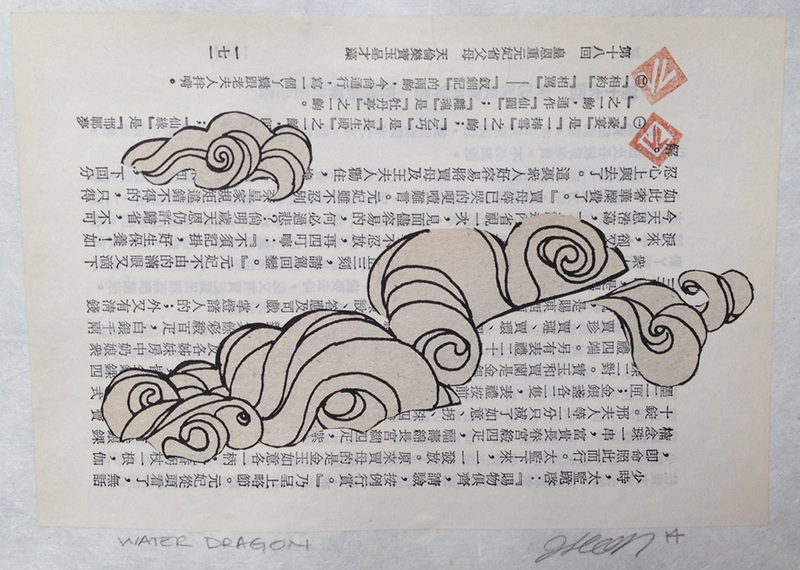 “Submerged”, and “Under Water”, 20″ x 7″ and 26″ x 10″ woodcut and linoleum prints on mulberry paper. Two variations using a mixture of the same plates. “Ex Libris”, 5″x7″ linoleum and toner transfer print on handmade paper. Made for the Australian Bookplate Design Award competition. The text in the background is from a 1943 edition of Jane Eyre by Charlotte Bronte set in “Monotype Bodoni with long descenders”. This is a two color linoleum print of a Dalmation puppy. Printed on mulberry. Paper size is 9″ x 12″, image size is 5″ x 8″. This is a three color linoleum reduction print of a Boston Terrier. Printed on mulberry. Paper size is 9″ x 12″, image size is 5″ x 8″. 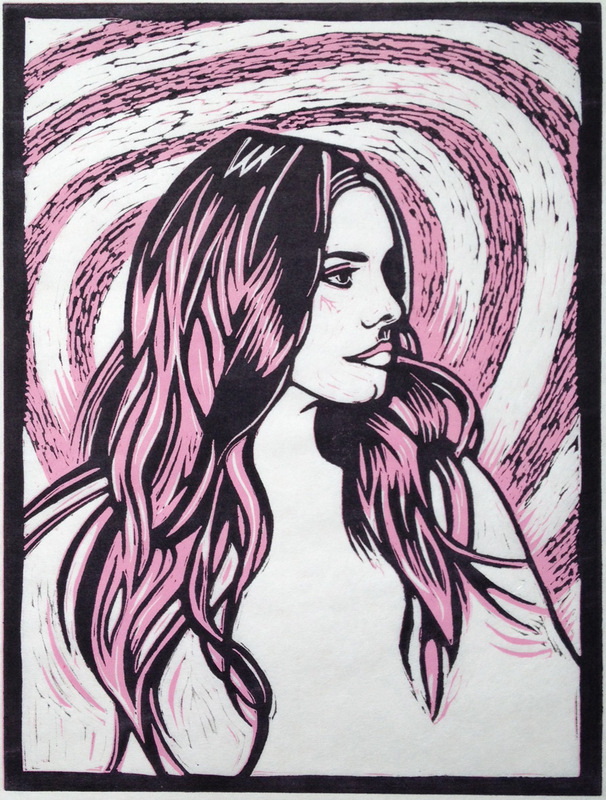 This is a hand-pulled 2-color reduction linoleum print of Lana Del Rey, in cotton-candy pink and black printed on mulberry paper. The image area is 9″ x 12″, and the paper size is 14″ x 16.5″. 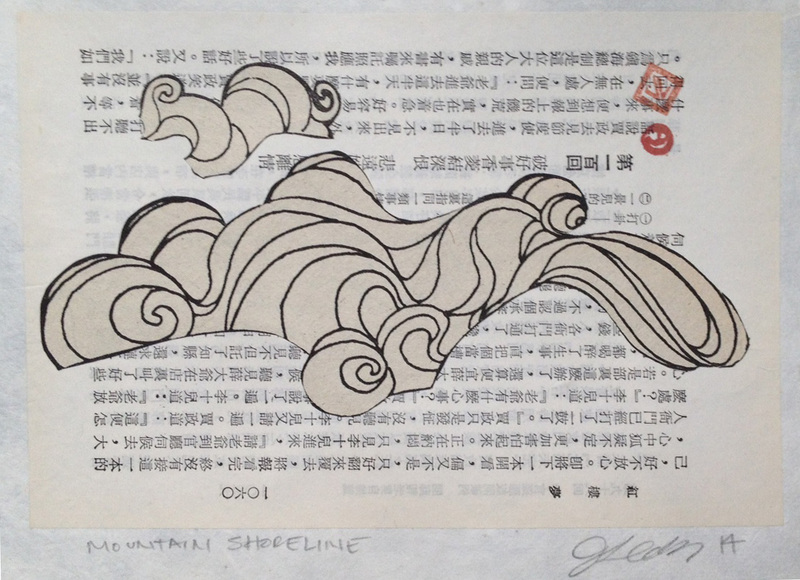 Collages inspired by Chinese landscape painting using book pages from the classic Chinese novel “Dream of the Red Chamber” and cut pieces of Barbie’s hair from a vintage 1982 Barbie coloring book. Mounted on handmade paper. Image size is 5” x 7.5”, paper size is 8” x 11”. Pages from an altered vintage game book using coloring book page collages.